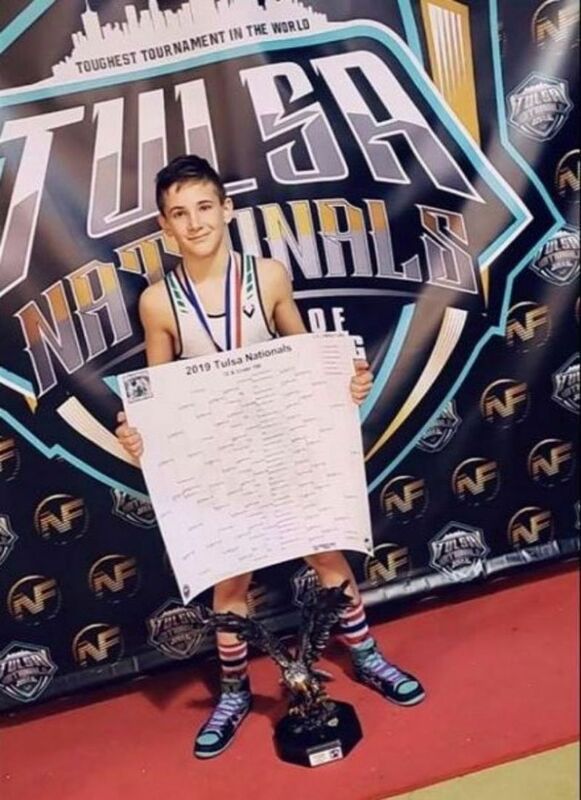 Midvale, Ohio - A young wrestler is back in the spotlight after claiming a championship title recently in the Tusla Nationals. Brayton Feister dominated his competition in the tournament's 10u division at 100 pounds with four first-period pins and a quick pin in the finals. Brayton is a fifth-grader at Midvale Elementary and the son of Bryant Feister and Mikey Felton. His other recent titles include: 2018 American Pride National Champion, 2018 NUWAY National Runner Up, 2018 OHWAY State Champion, 2018 OAC State 4th-place, 2018 Youth Iron Man Runner Up, 2017 Tulsa National Runner Up, 2017 Youth Iron man Champion, 2016 Tulsa Kickoff National Runner Up, 2016 OHWAY State Runner Up, 2016 NUWAY Nationals Third Place, 2016 OAC State Champion, 2016 Young Guns Champion, 2015 Novice State Champion, 2016-17 World All-Star member. Bryant also earns high marks in the classroom, consistently making his school's honor roll.